Foxconn, the company that assembles many of the mobile devices for Apple, Amazon, Microsoft, and Samsung, is dramatically expanding its factory in Zhengzhou, which currently produces up to 200,000 iPhones a day. When the expansion is complete, the plant would be the largest of its kind in the world, with 95 production lines capable of outputting a total of 400,000 iPhones per day. It’s not known whether the entire expansion will be dedicated to iPhone production – Foxconn prefers to maintain the flexibility to change product lines quickly in response consumer demand – the Zhengzhou plant is the main iPhone production plant at the moment, and if iPhone demand continues to raise it is likely that manufacturing would be centered in the same plant. 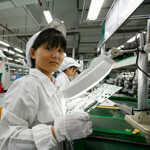 Foxconn has become a true manufacturing behemoth, employing 1.2 million people. The expansion of the Zhengzhou plant is expected to allow Foxconn to generate $20 billion in revenue from that plant alone. And it should help ensure that consumers get their tech toys in sufficient quantities for at least another couple of years. I really hope they arent paying for this expantion from taking from their worker's wages. Foxconn does make a lot of stuff, but at what price? Foxconn employess are so efficient that they commit suicide. They will find another employee that will work for less to take over their spot. What jacko said.